As 'Horrified' Annan Arrives in Damascus, Will Syria's Houla Massacre Force Action on the Crisis? Syria's 15-month spiral into a broad civil war has seen many massacres, with many grisly, grainy images of dead children, of entire families slaughtered standing as alleged evidence. Some have prompted international condemnation, sometimes in "the strongest possible terms," others have not. But the latest killings stand out  not least because they happened while U.N. monitors were in the country, observing a tattered six-week-old cease-fire that seems to exist only on paper. The U.N. has verified that 92 people were killed within hours in the Syrian district of Houla, including at least 32 children, their mangled corpses laid out on a plastic mat, set apart from dozens of adult victims. Some of the children were in blood-soaked pajamas; others had their skulls ripped open. They were killed by artillery and tank shells, the U.N. said; Syrian activists claim that others were butchered with knives. The Syrian opposition blamed President Bashar Assad's regime. The government blamed "al-Qaeda-linked terrorist groups." Activists say they relayed urgent pleas from the residents of Houla for help from about midday Friday, when the assault on their district began. Some of the activists say they asked U.N. observers to travel to the area, in the hope that their presence would be enough to protect its residents. The blue berets traveled the following day, on Saturday, in time to count the bodies. 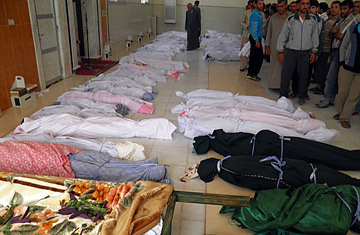 The Syrian government denied responsibility for the slaughter. Foreign Ministry spokesman Jihad Makdissi said at a press conference in Damascus on Sunday that the regime's tanks were not in Houla and its heavy weapons were not aimed at the region's residents. Instead, he said that heavily armed "terrorists," complete with mortars and antitank missiles, committed the atrocity. Syria has been subjected to "a tsunami of lies," he said. "We have set up a military and legal committee to investigate," he said, adding that "results will emerge within days." International condemnation has been much swifter. "This appalling and brutal crime involving indiscriminate and disproportionate use of force is a flagrant violation of international law and of the commitments of the Syrian government to cease the use of heavy weapons in population centers and violence in all its forms," U.N. Secretary-General Ban Ki-moon and Kofi Annan, Ban's predecessor and the joint special envoy for Syria, said in a statement. Annan has since arrived in Damascus for talks with senior leaders on Monday. "I have come to Syria at a critical moment in this crisis," Annan said as he arrived in Damascus on Monday. "I am personally shocked and horrified by the tragic incident in Houla." U.S. Secretary of State Hillary Clinton condemned the "atrocity." Even China said it was "deeply shocked" by the "cruel killings." The U.N. Security Council also held an emergency session on Sunday, after which it said the "outrageous use of force" against civilians violated international law. Previous Security Council attempts to censure Assad's regime have been shot down by Russian and Chinese vetoes. There was a call for another Friends of Syria conference, a group of Assad's Arab and Western opponents, but previous meetings have pledged various forms of support that many activists say have yet to materialize. The fact is, despite restrictions on media and aid organizations operating in Syria, the world knows what is happening there, it just doesn't know what to do about it. Will the Houla killings change anything, or will they be just another bloody footnote in a conflict that has killed an unknown number of people? The U.N. stopped counting Syria's deaths months ago. NATO has repeatedly said it has no plans to intervene in the conflict. The U.N. Secretary-General has admitted that "at this time, we don't have any Plan B" for Syria. It's hardly reassuring given that Plan A, the six-point Annan initiative, is barely viable. The pockmarked cease-fire was the centerpiece of that plan, agreed to by both sides, which also calls for the release of political prisoners, the provision of humanitarian aid via a "daily two-hour humanitarian pause," the right to demonstrate peacefully, freedom of movement for the press and the start of a Syrian-led political process to resolve the crisis. There are no alternatives being offered by anyone for this setup, "the only game in town," as it has often been described. The splintered Syrian opposition can't seem to agree on much, beyond the fact that it wants to see the end of Assad's regime. Still, it has called for foreign intervention along various lines  from the establishment of "humanitarian corridors" or "safe zones" to strikes on Assad's heavy weaponry and command-and-control centers. Is the international community, collectively beset by domestic economic woes and reeling from an expensive Libyan intervention, which looks like a cakewalk by comparison, ready to forcefully step in for some Syrians? And if it does, what and who will replace Assad? Both the regime and the opposition have now made it clear that they are in an all-or-nothing battle. Pro- and anti-Assad views have increasingly hardened, the gulf between them widening as the tallies of dead, missing and detained have grown. There is little room left for a compromise solution. When the Syrian uprising kicked off last year, there were no calls for foreign intervention, no demands for the execution of the President. There were also no car bombs blowing up in Syrian cities. The situation has become more desperate and more sectarian. The rebel Free Syrian Army, that ragtag band of undergunned and overwhelmed defectors and armed civilians, has said that in the wake of the Houla massacre it will no longer abide by Annan's cease-fire (not that it has kept to it in the first place). Syrians of all political stripes have grown used to hearing international condemnations. They have suffered other massacres. They have witnessed other international observer missions, like the Arab League one preceding the blue berets. They came, they saw, they wrote reports, but the only thing that changed has been the brutality of the conflict  which has gotten worse. The situation cannot be more dire. Will Houla mark a turning point? At least 92 people were killed. That much we know. The rest is politics.